Shellito, Viola June of Muskegon, MI passed away on Monday January 29, 2019 at the age of 86 from complications of a stroke. Viola was born to parents of Charlie and Matilda Glassnor on June 5, 1932 in Muskegon Hts., MI. She grew up as the youngest of 13 Children, all have preceded her in death along with her husband Harry Shellito. 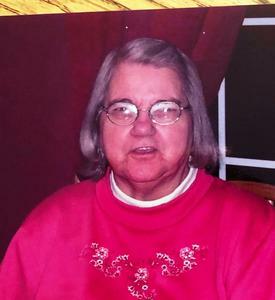 She grew up in Sullivan township on her family’s farm and attended Sullivan School. She married Gilbert D. Nelson in 1949 and the couple had 6 children. Viola married Harry Shellito in 1960 and the couple had 6 children. Viola was a homemaker, she enjoyed spending time with her Children, Grandchildren and her Great Grandchildren. Her hobbies included reading and playing bingo. Viola is survived by her daughters, Sanda (Monte) Harvell, Elsie K. Rhoads and Caroline L. LaFond and her sons, Richard D. Nelson, Harry R. Shellito, David G. Shellito, Clarence W. Shellito and Allen L Shellito. A private viewing of Viola was held with her immediate family on Tuesday February 13, 2019 at 1:00 PM at Phoenix Crematory Services LLC and her cremation immediately followed. The family is grateful for the condolences and donations can be made to Harbor Hospice of Muskegon.